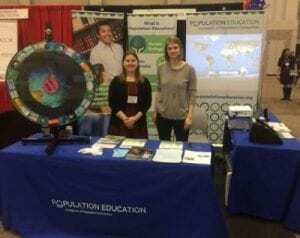 Population Education, a program of Population Connection, is the only national program with a strong emphasis on curriculum and professional development for K-12 educators that focuses on human population issues. We provide hands-on training to 12,000+ teachers and student teachers annually in North America. Tens of thousands of teachers are introducing important population concepts to their students using these outstanding resources and millions of students are benefitting from them. With an emphasis on hands-on learning and balanced discussion of different viewpoints, our program has earned a reputation for educational excellence. All Population Education curriculum materials are classroom-tested, rigorously evaluated and frequently updated to be leaders in their content and approach. They are interdisciplinary, well-suited for a cooperative learning environment and classroom-ready. All of the materials are matched to current national and state academic standards and frameworks. Population Connection (formerly ZPG), founded in 1968, is the largest grassroots population organization in the United States with 500,000 members, supporters and participating educators. The organization aims to educate young people and advocate progressive action to stabilize world population at a level that can be sustained by Earth’s resources. More information about Population Connection can be found at www.popconnect.org.